I love to visit the battlefields and all of the World War I events I can make. My other love is finding little shops and discovering oddities, toys, music, collectibles, interesting clothes and great buys. Sometimes I find things from the Great War that I wish to share or ask about. These items will be displayed on this web page. Please contact me with any comments you may have. 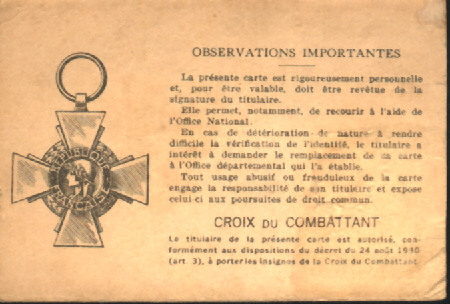 This card was found in a French shop during a 2003 trip to the Somme. 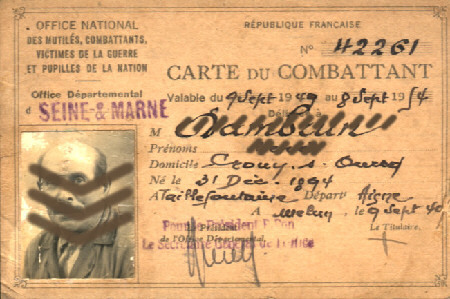 Apparently this veteran was authorized the "Croix du Combattant", but I don't know if he was also a "mutile".